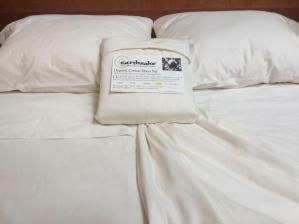 100% Certified US-grown Organic Cotton Duvets & Shams exclusively by Earthsake! Made & Grown in the USA! We are proud to introduce our new line of luxury organic cotton duvets & shams - using local organic cotton! Naturally soft and luxurious, simple & pure. Match to our new exclusive organic cotton sheet sets made the same way with local organic ingredients. Woven from long staple US-grown organic cotton with ring spun yarns, chemical free finish, no softners, formaldahyde or silicone used. Coconut Shell button closures. Unfortunately our current supplier is not able to handle the demand we have for the Ocean and Leaf colors. Please call for ETA. We are seeking a new supplier for this program and if you have any suggestions (or currently supply US-grown Organic cotton sheet sets, duvet covers and pillow shams) we'd love to hear from you. To be Certified Organic Cotton, fields must be chemical free for at least three years, including no run-off from surrounding areas where chemicals might be used. These linens must meet the highest standards for certified organic cotton by GOTS & USDA. To be Earthsake branded linens they must not only be organic and pure but local - the organic cotton can not be grown overseas like most other organic cotton you will find even when the product is "made in the USA". We source organic cotton from small organic farms right here in the United States (California & Texas) for a small carbon footprint and to support our local farms, local economy and local efforts to change the world for the better. We think globally and act locally - with the Earthsake label on these sheets you'll have the confidence in knowing that we sourced the best, most luxurious product in the most healthy & local way possible. The Earthsake line of products are organic, pure & local - and at 240 ringspun thread count they are as comfortable & luxurious as they are environmentally sound. 100% organic cotton grown in California and Texas, twill weave, 240 thread count ringspun. Coconut Shell button closures. Click here for the exclusive Earthsake Organic Cotton Sheet Sets that go with these great duvet covers & shams - available only at Earthsake! Click here for Earthsake's exclusive Organic Cotton Towels available with the same local organic ingredients!